Tickets available at the door, Tickets: $20 Adult; $15 Senior/Student; $10 Children under 13. 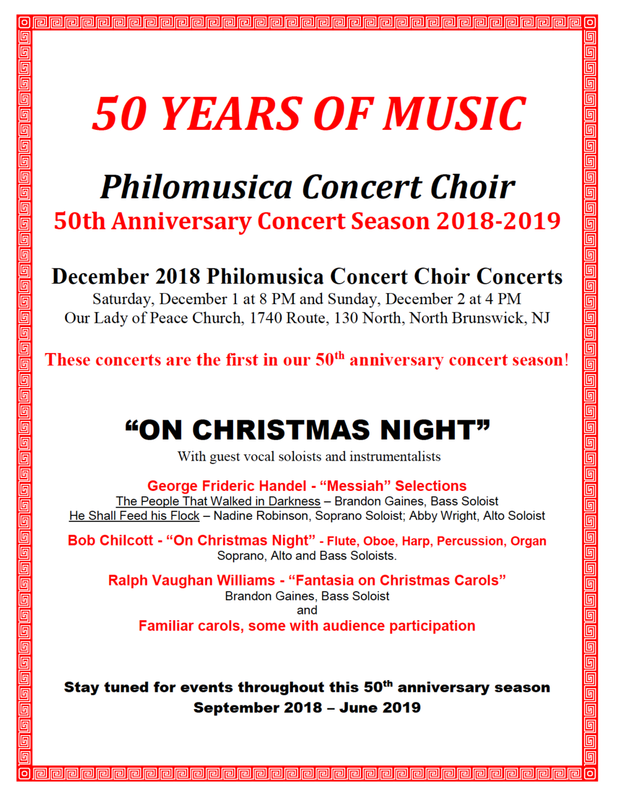 Discount of $2 on tickets bought in advance, call (732) 993-5400 or email info@philomusica.org. For the season finale, the Mid-Columbia Symphony will feature Gershwin's jazzy Rhapsody in Blue. The MCS will be joined once more by Mid-Columbia Mastersingers for Prokofiev's Alexander Nevsky, a magnificent film score which premiered in 1938. Featuring mezzo soprano soloist Abigail Wright. Join Abigail Wright on Thursday, December 21, 2017, 7:00 PM - 9:00 PM in NYC, as she sings the mezzo soprano solo from Steve Pilkington's rendition of I Wonder as I Wander with the St. Patrick's Cathedral Choir. Celebrate this joyful time of the year with traditional and contemporary Christmas hymns and carols! To end the evening, the Cathedral lights are dimmed to allow the candle lights to illuminate the Cathedral as "Silent Night" is sung. Reserved Seating is available to current (2017-2018) supporters of the Friends of Music. General Seating is free and open to the public. Please arrive early to ensure seating. Can't make it to the performance on July 12 at The National Opera Center? You can catch the repeat performance this July 27 at 8:30pm back at NYC's famous Cornelia Street Cafe with Classical at the Cornelia's celebrated duo Abigail Wright and pianist Kyungmi Nam - as they join forces with up-and-coming American soprano Christina Hourihan on a summer night you won't soon forget. Ms. Wright is an accomplished singer/actor whose wide-ranging career has taken her from the Metropolitan Opera stage to film, theatre, and Carnegie Hall. Christina Hourihan is quickly moving up the operatic ladder, performing breathtaking roles in operas and concerts from the Delaware Valley to Nevada, to the hills of Italy. No stranger to living composers and premieres, Ms. Hourihan introduces us to composer Douglas DaSilva, whose pieces "You Caress the Night" and "Dulce et Decorum Est" (world premiere) you will hear at the concert. Award-winning guitarist Kenji Haba of the guitar-cello ensemble Duo Anova will accompany Ms. Hourihan and Ms. Wright on these moving works. Pianist Kyungmi Nam brings her world-renowned expertise as a recital pianist to the collaboration, heralded for "…an awareness of detail… a clear sense of compositional structure…, a lively, vibrant sound and a wide palette of dynamics and colors." This evening features that wide palette in a way you won't forget, with arias and the "Barcarolle" duet from the beloved and beautiful Tales of Hoffmann, the intensity and sensuality of Carmen andLakmé, Rachmaninoff's Vocalise, and more! The cost is just a $10 cover charge and a $10 minimum, and reservations can be made at http://www.bit.ly/bncornelia or by calling 212-989-9319. Doors open at 8:30pm; reservations will be held until 8:45. Get away this July 12 at 7:30pm at Opera America with Classical at the Cornelia's celebrated duo Abigail Wright and pianist Kyungmi Nam as they join forces with up-and-coming American soprano Christina Hourihan on a summer night you won't soon forget. Pianist Kyungmi Nam brings her world-renowned expertise as a recital pianist to the collaboration, heralded for "…an awareness of detail… a clear sense of compositional structure…, a lively, vibrant sound and a wide palette of dynamics and colors." This evening features that wide palette in a way you won't forget, with arias and the "Barcarolle" duet from the beloved and beautiful Tales of Hoffmann, the intensity and sensuality of Carmen and Lakmé, Rachmaninoff's Vocalise, and more! Tickets can be purchased for $20 in advance at Eventbrite. Seating is limited, so get yours before they sell out.